See Our Plan for the Forum’s Vision and Objectives. 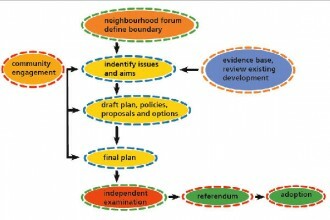 Under the Localism Act, communities are encouraged to establish neighbourhood forums. Prompted by Headington Action, amenity groups, residents’ organisations and individuals in Headington came together and decided to set up the Headington Neighbourhood Forum, covering broadly the Headington area (see the Our Area page for an explanation of how that area is to be determined). The aim of the Forum is to develop a neighbourhood plan. Headington Neighbourhood Plan, once adopted, will complement the Local Plan produced by Oxford City Council in that it will express the views of the community of residents and workers in Headington. These views on development and the environment of Headington will form a significant part of deciding any future planning applications in our area. The Forum is a group of volunteers from the local community and everyone who lives or works in Headington is invited to become a member. See the Forum>Get Involved page to join. Developing the plan is going to entail a huge amount of work so the Forum will need all the help it can get. This may be one small task or a major one, depending on the time you have to spare and how much you want to be involved.